When the Watsons decide to zip their porcine wonder into a formfitting princess dress for Halloween – complete with tiara – they are certain that Mercy will be beautiful beyond compare. Mercy is equally certain she likes the sound of trick-or-treating and can picture piles of buttered toast already. As for the Lincoln Sisters next door, how could they know that their cat would lead them all on a Halloween "parade" of hysterical proportions? Kate DiCamillo’s beguiling pig is back in a tale full of treats, tricky turns, hijinks, and high humor. 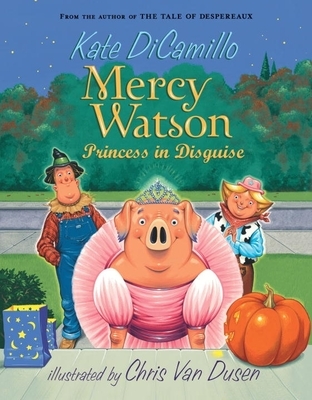 Kate DiCamillo is the author of The Magician’s Elephant, a New York Times bestseller; The Tale of Despereaux, which was awarded the Newbery Medal; Because of Winn-Dixie, a Newbery Honor book; and six books starring Mercy Watson, including the Theodor Seuss Geisel Honor Book Mercy Watson Goes for a Ride. She lives in Minneapolis.